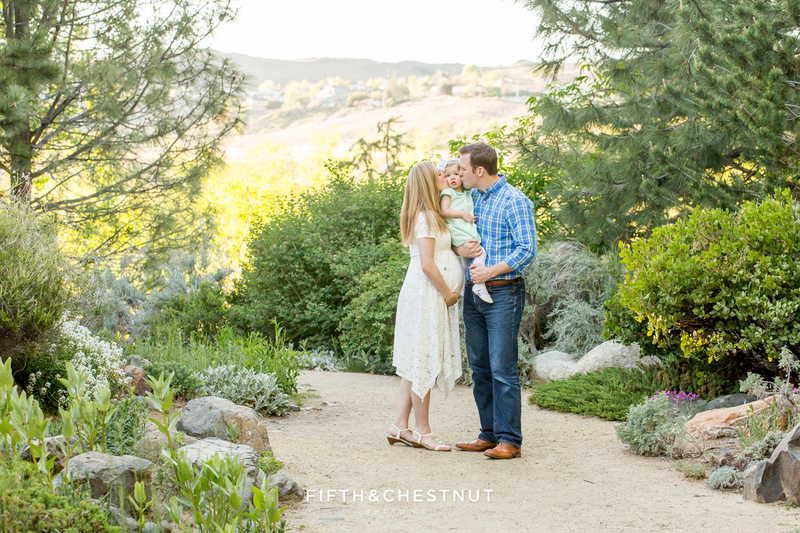 Finding a Reno Family Photographer that’s Right for You | Fifth and Chestnut Photo Co. When it comes to Reno family photographers, you have a lot of choices. In any budget or style, there is a multitude of people willing to serve you. I am grateful that you have found ME and you are interested in fine art portraiture for your family. Whether or not you select me to create portraits for you, I’d like to help you in finding a Reno Family Photographer that’s right for you and your family. How do you choose the RIGHT Reno Family Photographer for YOU? Your Reno Family Photographer should be a good fit for you. At minimum, you want a Reno Family Photographer who is friendly and professional. But you also want to look for someone who is great with kids (if you have them). You also want someone who has a wonderful attitude to make the process of a family photography session FUN and not stressful. And finally, you need to be comfortable in front of the camera to LOOK comfortable in front of the camera. Your photographer should give you an experience that makes you feel good while their lens is pointed at you! Do you notice any tearing/crackling in the binding or edges of their sample album pages? Your photo album is meant to be a lasting heirloom. If a photographer’s sample album is literally falling apart, that’s not a good sign. Are their albums designed in a timeless way? Do the images flow from well from one to the next? Does the photographer provide other products aside from an album? Can you get a professional canvas from them? How about a professional print? Can you purchase gift options to treat the special people in your life? Think of your parents and how much they would adore a sweet photographic gift of their grandchild. While searching for your Reno Family Photographer, you might be overwhelmed by the choices. If you rush while selecting your photographer, you could overlook an important aspect of their photography – their style. A Reno Family Photographer’s style isn’t just about the technical aspects or the angles. It is about their unique perspective and creativity. It’s also the way in which they edit the images. And in fact, it is the WAY they take the images. You’ll notice that my photos are bright…light and “airy.” I love using backlighting techniques. I don’t shoot in direct sun and I make sure the light on your faces is soft and natural. That’s MY style, and if you dig through my portfolio, that is what you will see. Is your Reno Family Photographer’s style a fit for you? Is it timeless? Or are they using a trendy one-click filter in a way that will fade with time? Will they meticulously edit your photos? Or will they rush your pictures to you without hardly glancing at their final product? A quality Reno Family Photographer will take a beautiful photo on the day of your session and edit it to make it stellar. Professional family photographers should spend a considerable amount of time editing images. If they shoot your session on “auto mode” and give you the images straight out of the camera…that is not the work of a professional OR an artist. 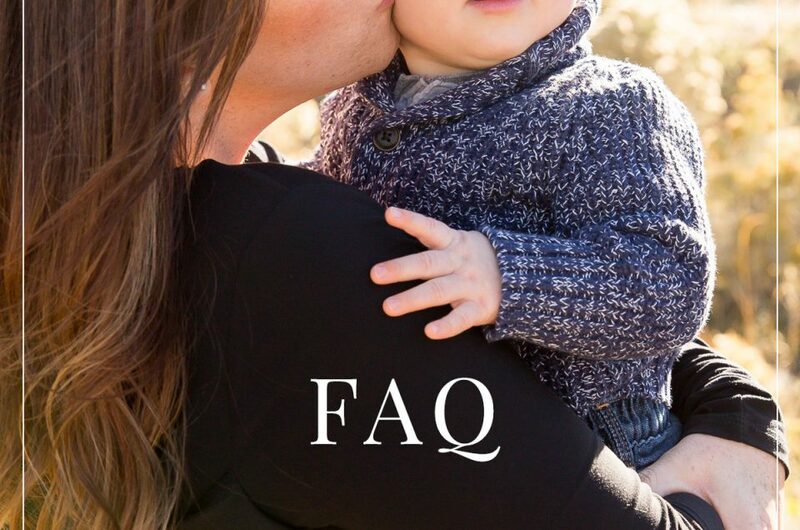 These are the top things to consider carefully when choosing yourReno Family Photographer. But one more thing: although price is something you must consider, you may not want to make it THE deciding factor. One day, family photographs are going to be the ONLY keepsakes you have left after time moves on. They are also one of the major things families hand down to their children. The value of your photographs is immeasurable. Watch for red flags when selecting a photographer whose prices seem too good to be true. Reno Family Photography is an investment. I firmly believe that everyone deserves to be happy with their family photography at any price point, but below a certain amount, you are asking a hobbyist to create these lasting keepsakes. No one deserves the feeling of regret when viewing their family photos after spending so much time preparing for them. We hope these tips will help you avoid that situation as much as possible. 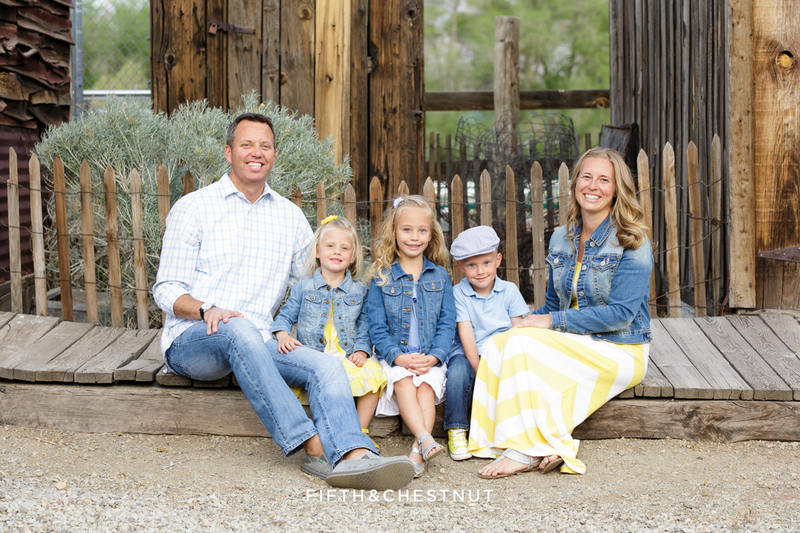 Fifth and Chestnut Photo Co. is a Reno Family Photographer. We serve the greater Northern Nevada and Northern California areas. Contact us and find out how this Reno Family Photographer can create fine art portraiture for your family! 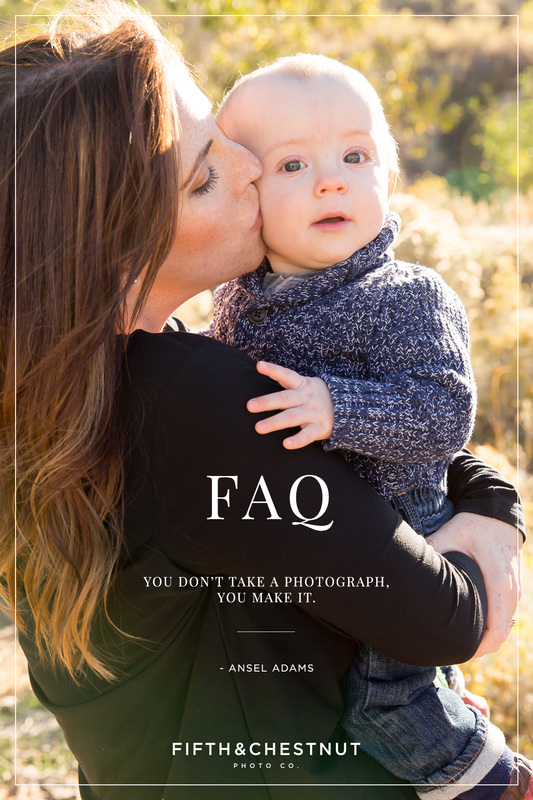 I put this FAQ together to prepare my clients and clients-to-be for a portrait session with me. I have tried to answer the common questions I receive (and some not-so-common). I know that choosing me as your Reno family photographer isn’t a decision you take lightly – if you are reading this, I know that you are looking for the best of the best and you love my work. That’s why I want to educate my clients and potential clients about the Fifth and Chestnut Photo Co. experience. 1) A session fee that covers my creative camera time & culling, editing, preparing your images for viewing and other behind-the-scenes stuff I do for your session. 2) A $249 minimum product order (pre-tax) at an in-person ordering appointment (or via the online gallery for non-local clients) per session. If you book my Milestone Baby Program or a maternity/newborn bundle, you have a $249 minimum purchase to make for each photo session in your program/bundle. Although I allow you to use images from multiple sessions in an album, images from multiple sessions can not be combined into one digital purchase. I describe my style as authentic and heartfelt. I don’t use trendy filters in my editing process, nor do I fall into the hype of other trends because your photos should stand up to the test of time. Over the years, I have developed my own unique editing process to give my images the look and feel that they have. What kind of investment should we be prepared for? I offer three product collections per session type, starting at $249. I also have an extensive a la carte menu and added discounts to families who purchase a collection. Most families invest $729 or more in their photo products and display items. Some go all out and purchase my collections that are $1299+. Very few families invest only the $249 minimum. If you live in the Reno/Sparks area – your ordering appointment is a required part of the photography process. If you aren’t a local, I make ordering via my online gallery easy! My goal is for you to display your portraits in your home via wall displays or albums (or other photo products) and this ordering appointment is pivotal in achieving that goal. At the time of writing this FAQ (9/27/18), the download of all the hi-res digital images on my a la carte menu is priced at $499. Singular digital images may be purchased individually at $39/ea a la carte. My goal is always to create professionally produced photographic products for you, and although I love digital images for sharing with friends and family (and for long term safe-keeping) – they most often get stuck on a hard drive or lost when you get a new computer and forgotten. I am very passionate about providing prints, canvases and other physical photographic display items! Will you travel for my session? I am happy to travel around northern Nevada & northern California for an additional fee of $50 per 50 miles outside of Reno/Sparks. Can we book you for more than 1 hour? Yes, and in fact, I recommend that family groups of more than 6 people book a 2 hour shoot. I also recommend more time if you want more than one outfit. I can shoot for a max of 2 hours for a portrait session. What if our session is going over time? I don’t necessarily keep my eye on my watch, but I tend to know when our time is almost up, and I will check to see how we’re doing so that our session ends on time. I don’t want to keep my clients from the rest of their day’s plans by shooting past what has been discussed, and I often have other commitments to attend to. Can we wear more than one outfit? In a one hour session, I recommend one outfit for families. Individual subjects can safely get away with two outfits in one hour (high school seniors, baby’s one year session etc). Outfit changes (especially for an entire family) take a considerable amount of time away from shooting time, which seriously impacts your photo results. If you would like more than one outfit for your family, I’m happy to schedule a 2-hour shoot to accommodate that! And if you’d like to change into your clothes once you arrive at the location (rather than wrinkle them during the car ride), plan accordingly and arrive 10-15 minutes early to get dressed and ready. Speaking of outfits, what should we wear and bring to our session? I have this whole blog post dedicated to answering this question about wardrobe and props! Can you shoot in a certain style that I want or use a certain backdrop at a location? I trust that you have looked through my portfolio and have chosen me as your photographer because you like what you saw! I use soft, natural light and backlighting techniques to get the beautiful portraits shown in my portfolio. I photograph my clients within certain landscapes at specific directions because I am looking at the LIGHT. I can’t control the light (sun), but I can control where I place you! Occasionally I will take photos in the bright sun, but it’s not often and I usually reserve that for candid shots. If you are wanting something that you don’t see in my portfolio, I encourage you to discuss what you’re looking for before selecting me. You get the best portraits when you trust my locations, backdrops, poses and methods. Can you photograph us in front of Lake Tahoe? Everyone loves Lake Tahoe. It’s a fact! But if you’re more interested in getting that beautiful blue lake & mountainous skyline with blue sky above it in the background than you are in having soft, beautiful light on your family’s faces, that’s just not the type of photos I offer. I am a natural light photographer (meaning – I don’t bring off-camera lighting with me to my shoots), and simply can’t get that gorgeous blue lake & sky in all it’s glory unless I photograph you with your face TO the sun. That means squinty/unpleasant expressions and sometimes drips of sweat running down cheeks. It’s not my style. I will happily photograph you walking down the beach candidly and get some beautiful lake scenery that way…but I am not a fan of photographing people looking into the sun. It’s not even possible at every location. Some spots are just not situated appropriately to get the pristine Tahoe blue background – there may be shadows caused by mountains or trees in the way, or we just can’t physically shoot in the proper direction due to the shoreline. Although a beautiful landscape can be part of your family portrait (and the Tahoe examples in my portfolio ARE gorgeous the way I shoot them), it is not the focus. Can I give you a shot list from Pinterest? I really love some images I found there. I don’t accept shot lists of any kind other than your specific portrait grouping requests such as Kid 1 solo, Kid 2 solo, Kid 1 & 2 together etc (which I honestly don’t need because I will get those shots anyway). Pinterest is a fun tool for planning your session wardrobe and props, but asking me to recreate a shot by another photographer is asking me to copy someone else (aka copyright infringement – yikes). Also, I can’t recreate things like the time of day in which a photo was taken, or a particular landscape that just doesn’t exist at your chosen location. If I attempt to recreate something purposely, you may be disappointed – and I aim to take your breath away with unique imagery. I will photograph you in a way that is true to my artistic vision and style. I enjoy working with families who completely trust me to create amazing images that are authentic to their individual family dynamic. That level of trust is paramount in our relationship. What happens if my family is late to the session? Sessions are cut short when clients are late. I totally feel for families who run behind due to extra diaper changes, spills on outfits or naps running off-course (been there!!!) – however, I can not extend the session time. Sessions are scheduled at the perfect time of day to achieve my style of portraiture…and when the light goes away, there is no bringing it back! And of course I also have a schedule of my own at play. PS. Do bring an extra set of clothes & shoes for your kids (and maybe even you) because they could come in handy. What if the forecast calls for rain/snow? My inclement weather procedure is to wait until the day of our scheduled shoot to see how the area’s weather is doing about 3 hours before the session start time (our weather in Northern Nevada can be unpredictable despite the forecasts). If anyone in your group is getting hair/makeup done and 3 hours notice is not enough, please let me know so I can plan for more advanced notice! In the case of rain forecasted, a reschedule is usually needed. In the case of snow, a light snow can be beautiful in photos, so clients have the option to go ahead with a snowy shoot (unless it’s so snowy & wet that my equipment is at risk of damage) or reschedule at a later date. Portrait photos are typically ready to view in 3 weeks. I don’t post “sneak peeks” prior to your ordering appointment. I also don’t send out online galleries to local clients until after your ordering appointment. Can you rush my images? Since I am a mom of twins, a toddler and a teenager, I can not rush images at this time. To do so, I would have to miss events or other things that are important to me and my family. Can we have your RAW images? I don’t transfer my RAW files under any circumstances. Any outtakes, out of focus images or images I just decide not to include in your collection hit the cutting room floor and are deleted prior to your ordering appointment. Do you have proper business credentials and insurance? You bet I do! Fifth and Chestnut Photo Co is a Limited Liability Company, and I am insured and carry state and city business licenses. I also pay taxes – including the state sales sax that I collect when you make your product purchase. In addition, I carry a Washoe County Parks Permit which gives me permission to photograph you in our lovely local city parks. Tell us more about you, the woman behind the scenes! Although I breathe, sweat and bleed (mostly because I’m clumsy and will do almost anything for the perfect shot) for my photography business, I also do all of those things for my beautiful family. My motto is “family is my heart” – which has helped me shape my business into something that brings a work-life-balance to our lives. It offers me flexibility to be with my family at important times, and to spend precious time with my kids…helping them grow and learn. It keeps me passionate about what I do. My photography business is such a personal part of myself that it’s sometimes hard to separate, but I am always striving for the perfect balance between being an artist/entrepreneur with being a great wife and mommy. To that end, my availability is limited, and when you book with me, you have a LOT of my attention because I am not working on 30 other jobs simultaneously. I have a toddler, twin babies and a thirteen-year-old stepson. My husband works for the magnificent City of Sparks, where we also live! I also have graphic design and illustration skills, and one of my dreams is to write and illustrate a children’s book. My work experience has taken me from political marketing to graphic design to the music industry to the corporate world (phew!!) and now my passion for photography since my graphic design days has taken over my life! If you have any questions about me or how I can provide an amazing Reno portrait photography experience for you, please get in touch. I want to know you, and I want to create portraits you’ll treasure your whole lifetime! The West Shore Cafe & Inn is one of Lake Tahoe’s best wedding venues. As a Lake Tahoe Wedding Photographer who photographs weddings at a wide variety of Lake Tahoe wedding venues, I say this for many reasons, but I’ll highlight just FIVE reasons why it’s so great. It’s my end-of-2016 spotlight! West Shore Cafe is located in Homewood and therefore is in one of the quieter parts of the lake. Think less traffic (foot and vehicle). There is also a long pier that leads out to an amazing view of Lake Tahoe. Not only can you see the lake from the deck or pier, West Shore Cafe has large floor-to-ceiling windows so you can enjoy that view from inside the building, too. In addition, there is a BEAUTIFUL bridal prep room on the second floor with, again, sweeping views of Lake Tahoe. It’s an amazing space. You can also stay in the lodging next door, which is luxurious and beautiful, to make it an easy walk to and from your wedding venue for yourselves and wedding party, too. If the combination of lush greenery, stunning lake views, ample dock areas, elegant indoor space and lovely architecture isn’t enough, you also have a vast rocky shoreline on top of it! If you book your wedding at West Shore Cafe, you really don’t need to travel anywhere else for photo purposes. Alongside the lovely Tahoe views, the private lakefront dining room itself provides a really great atmosphere. The open restaurant area is hung with chandeliers (which are almost haunting – in a cool way, I promise) and the woodwork and detail on the bar area is awesome, too. Tahoe-esque elegance is echoed all throughout the venue and I simply adore the atmosphere this building and it’s surrounding areas create. The lakefront deck and pier also has a splendid atmosphere in which to enjoy your wedding day cocktails or dinner. The paver patio and heat lamps make it a cozy space to enjoy an afternoon or evening wedding no matter the season. Oh and the food…the food!! Delicious. And beautiful. Plain and simple. But okay, to elaborate if I must, the appetizers and meals I’ve had at West Shore Cafe have been divine. And not only do they taste incredible, West Shore Cafe makes a point to make their food LOOK beautiful, too. Your guests will definitely be impressed with the delectable appetizers, meal (and even late night snack if you so choose)! Since I’m a wedding photographer and my job is MONUMENTALLY important, I don’t drink on a wedding day, but I can tell you that West Shore Cafe makes some really amazing-looking cocktails, which I can only assume are damn delicious. It’s no secret that a photographer would be really interested in light! Throughout the day, the light I find at West Shore Cafe and surrounding properties is stunningly gorgeous. I adore photographing my couples in the afternoon light filtering behind the lodging and trees. I also fall in love with the sunshine out on the piers, and side-light coming through as you’re walking down the beach, too. When the sun starts to set behind the western mountains right along the shore, the light becomes cool-toned and highlights the blueness of the lake, and West Shore Cafe pier is the perfect spot to get some great wedding day silhouettes with the sky behind you, or we can light some portraits with off-camera flash to not only highlight the sky, but highlight your beautiful faces and the joy you’re feeling in that moment, watching the lake as the sun sets on your wedding day. Everyone I’ve worked alongside at West Shore Cafe weddings has been marvelous. Happy faces, positive attitudes and willingness to cooperate with my requests. For example, I asked a server to hold out a plate of apps so I could get a nice photo, and not only did he comply, he did so with a happy smile. AMEN! I can’t tell you how many times I ask this of servers at other venues (and catering companies) and they either refuse or have a nasty look on their face. Here, I have personally only found friendly people. As a vendor, I’ve been treated so well at West Shore Cafe. I’ve gotten to actually sit down and really enjoy a meal there because they are so hospitable and welcoming to not only your guests, but your other wedding vendors as well. It’s a sign of true professionalism in my book. Interested in booking West Shore Cafe as your magnificent wedding venue in Lake Tahoe? Check out their website and contact them for more info! Interested in checking out my work? Take a peep at my wedding portfolio and get in touch if you like what you see! Fifth and Chestnut Photo Co. is a Lake Tahoe Wedding Photographer team serving the greater Northern California & Northern Nevada areas. If you are searching for an experienced, talented and professional Lake Tahoe Wedding Photographer, contact us and find out how our Lake Tahoe Wedding Photographer team can document your day beautifully!